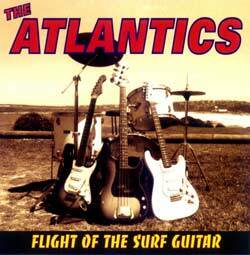 Flight of the Surf Guitar – The classic album from The Atlantics – Australia's legendary instrumental Surf garage band. When I heard that the Atlantics were back together, I was cautiously stoked. Many reunions just don’t hold up, or use the name but lose the style. Then, this CD came in the mail. Hot dog! This is a great CD! Original members Jim Skiathitis – guitar, Bosco Bosanac – bass, and Peter Hood – drums are joined by newcomer Martin Cilia – guitar, who wrote nearly all of these great tracks.